com. A native of the Pittsburgh suburb of Green Tree Pennsylvania Paul is a graduate of Gettysburg College and the Duke University School of Medicine where he earned his medical degree. It's difficult for one who loves true liberty and utterly detests the power of the state to come to Washington for a period of time and not leave a true cynic. 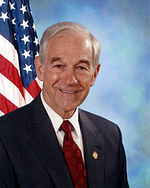 He served as a flight surgeon in the U. Paul is best known for his libertarian views and is a critic of American foreign domestic and monetary policies including the military–industrial complex the War on Drugs and the Federal Reserve. He worked as an obstetrician-gynecologist from the 1960s to the 1980s delivering more than 4000 babies.